There are currently 985 preferred stocks and exchange-traded debt securities (ETDs) trading on U.S. stock exchanges. That's both the good news and bad news. Good news because 985 securities is plenty for preferred stock investors to pick from; bad news because 985 is a lot to try and pick through to find just the ones that fit your specific criteria. Common criteria for such a search include investment grade ratings and a current market price that is below the security's par value (usually $25 per share). While such ratings do not have the credibility they once did, the fact is that most investors use them as a proxy for investment risk. And purchasing shares below their par value adds a layer of principal protection to your investment plus positions you for a nice capital gain, on top of the regular dividend income that these securities pay, in the event of a downstream call by the issuing company. The new preferred stock search engine described in the Special Announcement article below was able to find 18 investment grade preferred stocks that are trading for less than their $25 par value (September 27, 2012 prices). Figure 1 presents the filter screen from the new preferred stock search engine used to find these gems and it found them in less than 10 seconds (including the time to set up the filter parameters). Notice that the "Moody's" field is set to "Investment Grade" (lower left under the Ratings heading) and the "Currently priced below par" field is set to "Yes" (center right under the Today's Market heading). There are a total of nineteen preferred stock characteristics that can be set, each of which has multiple values to pick from so you can tighten the search down as specifically as needed (or not). In addition to finding securities with Moody's investment grade ratings and are currently trading below their $25 par value, this filter also limits the list to just issues that are trading on the New York Stock Exchange (NYSE) and have not suspended their dividend payments. 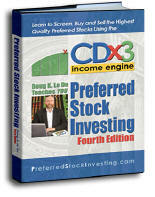 The Create Your Own Filter page applies the criteria you specify to the Preferred Stock ListTM database available to subscribers to the CDx3 Notification Service (my preferred stock email alert and research newsletter service). Of the 985 preferred stocks and ETDs trading on U.S. stock exchanges, there are 18 specific issues that meet the common criteria used here. Figure 2 shows the results (please note that to protect the values of subscriptions to the CDx3 Notification Service, trading symbols are obscured here. Already a subscriber? See page 6 of the October 2012 issue of the subscriber's newsletter, CDx3 Research Notes that you received on September 27 for symbols). 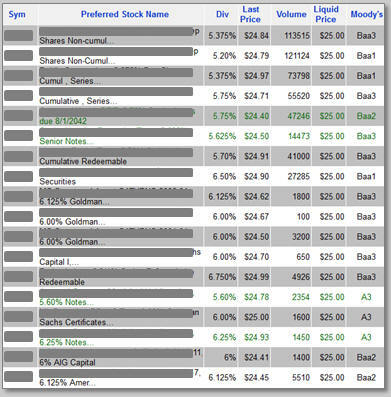 The four securities shown in green font are ETDs (bonds that trade on the stock exchange rather than the bond market and are very similar to preferred socks) while the remaining fourteen securities listed are preferred stocks. All have a current market price (seen in the Last Price column) that is below their $25 par value (as shown in the Liquid Price column) and enjoy an investment grade rating from Moody's (the Moody's column). Already a subscriber? The trading symbols for this example are provided on page 6 of the October 2012 issue of the subscriber's newsletter, CDx3 Research Notes. (Already a subscriber? 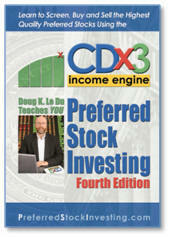 For actual symbols see page 6 of the October 2012 issue of the subscriber's newsletter, CDx3 Research Notes). The same preferred stock characteristic that played such a key role in saving preferred stock shareholders during the Global Credit Crisis worked its magic once again a couple of weeks ago. On September 13, 2012, Citizens Republic Bancorp (CRBC) announced a merger agreement with First Merit (FMER). This deal was not only important for the principals, their shareholders and customers, but it serves as a real world reminder to preferred stock investors of how important the cumulative dividend characteristic can be. The April 10, 2012 Seeking Alpha article titled "Identifying The Lowest Risk Preferred Stocks" uses the Global Credit Crisis (June 2007 through March 2009) as a study period to examine the relationship between the troubled banks that failed during that period and those that survived. Specifically, the analysis evaluates the characteristics of the 70 preferred stocks issued by these twelve struggling banks during extreme conditions in order to determine if there were signals that would have tipped off investors to the higher risk preferred stocks. Eight of these twelve Big Banks failed while four survived through acquisition. The eight that failed had 57 preferred stocks trading at the time; the four that survived had 13 preferreds trading. Interestingly, the 13 preferred stocks issued by the four Big Banks that survived all met the ten "high quality" preferred stock criteria found in chapter 7 of my book, Preferred Stock Investing. Further, the 57 preferred stocks offered by the eight Big Banks that failed were those that were unable to meet the high quality criteria. The high quality criteria, first published in 2006, got it right in 70 out of 70 cases. Countrywide and Merrill Lynch were acquired by Bank of America (BAC), National City was acquired by PNC Financial (PNC) and Wells Fargo (WFC) grabbed Wachovia. The preferred stocks issued by these acquired banks continued to pay their dividends uninterrupted. "Using the Global Credit Crisis (June 2007 through March 2009) as a study period allows us to see the relative importance of preferred stock characteristics and their contribution to investing risk. While all characteristics are important and should be considered by preferred stock investors, the cumulative dividend characteristic separated winners and losers more definitively than any other characteristic during those very extreme conditions." With one exception, there has never been a case where a preferred stock that was able to meet the ten "high quality" criteria missed a dividend payment (my data goes back to 1926). The exception is the trust preferred stock issued by Citizens Republic Bancorp on September 28, 2006. 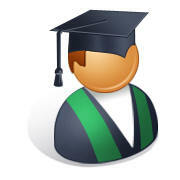 CTZ-A has a dividend (coupon) rate of 7.50% which computes to a quarterly dividend obligation of $0.4688 per share. Citizens is headquartered in Flint, Michigan, home of the U.S. auto industry. While Citizens survived the Global Credit Crisis (2007—2009), the auto industry meltdown that followed was a staggering second blow. The bank deferred the dividend on CTZ-A, its only publicly traded preferred stock issue, on January 28, 2010. Since then, the management team at CRBC has worked diligently to recover. On July 28, 2011 the bank announced that it had returned to profitability. But the big news for CTZ-A shareholders came just a couple of weeks ago on September 13, 2012 when the bank announced a merger agreement with Ohio-based First Merit. While the merger will take several more months to complete, Fitch released a statement saying that Fitch "...expects CRBC's outstanding trust preferred shares to become current..."
Procedurally, the merger deal has to come to fruition and at that time the merged company's board of directors will declare the (massive) dividend for CTZ-A. The New York Stock Exchange will set the ex-dividend date at about two days prior to the record date declared by the board. Those holding shares of CTZ-A on that ex-dividend date will receive the declared dividend. In anticipation of the big payout, the market price of CTZ-A jumped on the announcement. 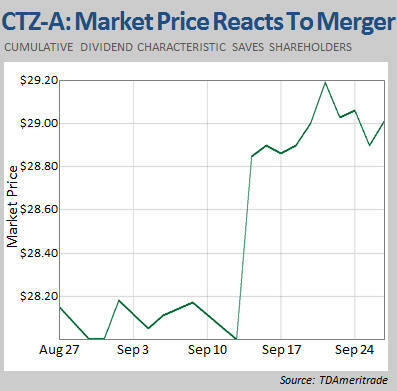 It is because CTZ-A has the cumulative dividend requirement that CTZ-A shareholders appear about to be made whole again. Just as it did more than any other single characteristic during the Global Credit Crisis, the cumulative dividend characteristic appears to have once again saved preferred stock investors. Congratulations to CTZ-A shareholders; it looks like your patience is going to pay off. 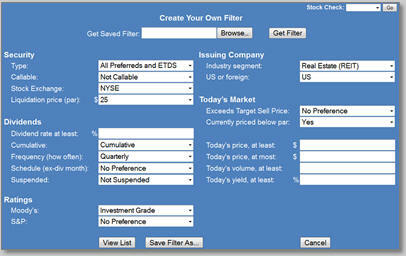 On October 1, 2012 we added a very powerful feature to our Preferred Stock ListTM software application. 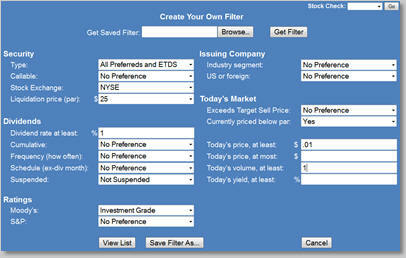 The Create Your Own Filter page allows subscribers to the CDx3 Notification Service to define their own filter when searching our Preferred Stock ListTM database of preferred stocks and exchange traded debt securities (ETDs). The CDx3 Notification Service is my preferred stock email alert and research newsletter service.